Image: Keith Scott/Getty Images. Design: Kenzie Mastroe/SheKnows. We buy everything online these days, from books to groceries to lingerie to, yes, mattresses. And though buying something so large and so tactile online can seem strange — is it really wise to buy a mattress without testing it first? — there are a ton of benefits to going the mattress-in-a-box route over the traditional innerspring mattress showroom experience. Boxed mattresses vary from traditional innerspring spring mattresses in a number of ways. The best is probably that you don’t have to go to a mattress showroom to deal with pushy salespeople and confusing seasonal pricing in order to get your hands on one. Companies like 2920 Sleep, Casper, Leesa, Tuft & Needle and more all sell online. If you’re considering buying a boxed mattress, we talked to Karim O’Driscoll, the head of product development and operations at 2920 Sleep, to get the low-down on this hot new trend. Delivery: Traditional mattresses are hugely bulky, and getting them inside your home can require an extra set of hands and pricey shipping and delivery. Mattresses in a box are compressed and stuffed into a large box you can easily fit through your door, and most companies offer free or cheaper-than-average shipping. Material: Boxed mattresses can be made of a variety of materials. Most of them do not have inner springs and are instead made up of layers of memory foam, latex and other proprietary materials. It depends on which company you go with, so make sure to do your research if you have a preference. Cost: In general, mattresses that come in a box are less expensive than their showroom counterparts (the exception being Ikea). These companies don’t have to worry about footing the cost of rent for all their showrooms, nor do they have to worry about paying salespeople to staff them, so the cost is lower. You can get a mattress in a box starting at about $600 depending on the brand you choose. “Move the box into the bedroom, slide the mattress out onto the frame, unwrap it and watch it inflate, and you’re done,” O’Driscoll continues. Once you unbox, the mattress will need up to a day to properly fluff up to its full size. You can use a traditional box spring with your mattress in a box, though most work just fine on a platform bed or a slatted base too. Many companies have a generous trial period, so you can sleep on your mattress for a while before deciding if you need to return it. That’s a relief — mattresses are an investment, and making sure yours is comfortable is essential. How supportive are boxed mattresses? Like traditional innerspring mattresses, you can find boxed mattresses at different levels of firmness. In general, they offer more consistent support than a traditional mattress, though some models offer variable firmness in each mattress to support the contours of your body. They do also tend to be a little softer than an innerspring mattress due to their foam content. How long do boxed mattresses last? 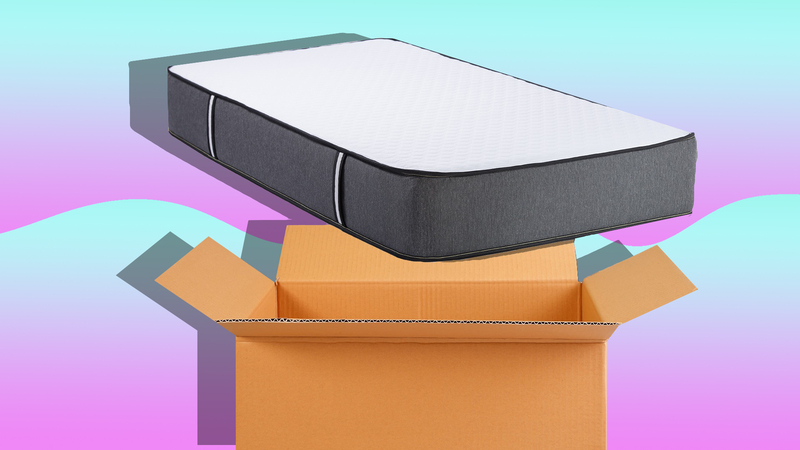 Will boxed mattresses make me hot at night? “A well-designed boxed foam mattress will sleep as cool as the equivalent traditional foam mattress,” O’Driscoll says. The first boxed mattresses that came out were mostly made of memory foam, which is notorious for making hot sleepers feel even warmer than usual at night. Luckily, these days, most companies use different layers of foam to create channels that will keep you cool. “Because foam mattresses tend to sleep a little warmer than traditional inner-spring mattresses, the 2920 mattress was designed with two key features to promote a cooler sleep environment: The top layer of foam is a new generation — and more expensive — of very breathable foam that helps air circulate and keep you cool, and the fabric cover has an ‘adaptive’ treatment (similar to athletic clothing) that helps improve moisture evaporation, which helps the sleeper,” explains O’Driscoll. So, is getting a boxed mattress worth it? If you do have the chance to try one out (at a friend’s or at a store) before making the purchase, then you should definitely do that. But even without testing one first, if you’re on a budget, don’t want to deal with salespeople at a mattress showroom and don’t have any super-specific support needs, then it’s definitely worth a try. Since most of the mattress-in-a-box companies have generous trial periods, at worst, you’ll end up getting a refund and getting a traditional mattress, but at best, you’ll have a hassle-free experience that costs hundreds of dollars less than buying an innerspring mattress. Sounds pretty good to me!